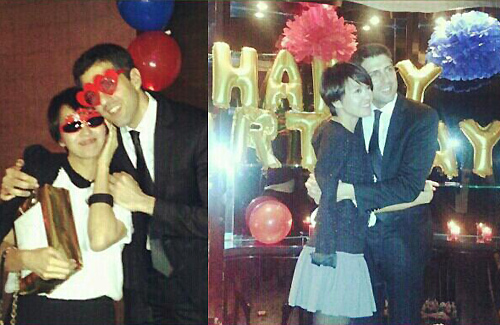 Above: Gigi Leung celebrates her 37th birthday with husband, Sergio. Already over a year into their marriage, Gigi Leung (梁詠琪) and her Spanish husband, Sergio, are still as passionately in love as ever! On March 24, one day before Gigi’s 37th birthday, Gigi and Sergio were spotted riding around Hong Kong Central’s Conduit Road in Sergio’s $300,000 HKD white mini cooper. Sergio stopped by a gas station near the Hong Kong International Airport to fill up. The Spanish hunk glanced longingly at Gigi several times, and gave her a kiss on her cheeks. During the seven-minute stop at the gas station, Sergio pecked Gigi at least two times on the cheeks. Sergio parked inside the airport’s parking lot at approximately 1:30 PM. The couple stayed inside the parked vehicle for the next 45 minutes, chatting and giggling. Gigi and Sergio kissed passionately in the car five times. Sergio often brushed his hands over Gigi’s cheeks and hugged her tightly; they were an inseparable pair. Sergio and Gigi left their car at approximately 2:20 PM. The entwined couple stopped by a coffee shop and shared a cup of espresso. After coffee, the couple bought two fruity drinks, and shared their drinks. Sergio occasionally stole a drink from Gigi, and, oblivious to their surrounding crowd, Gigi happily returned his kisses. The pair then went to pick up Gigi’s uncle and aunt from the United States. The elderly couple reportedly arrived to Hong Kong to celebrate Gigi and her younger twin brother’s 37th birthdays. Sergio had planned the secret surprise party for more than two months. Not only is Gigi’s love life on the top, Gigi is also enjoying career success. Gigi is set to star in Pang Ho Cheung’s (彭浩翔) new comedy film with Louis Koo (古天樂) and Miriam Yeung (楊千嬅). The film, temporarily titled Hong Kong Boy <香港仔>, will narrate the humorous encounters of a Hong Kong couple. The thing I dislike about Gigi Leung is that she loves to flaunt her relationships and show off what a perfect life she has. She’s the the chinese equivalant of Gywneth Paltrow. Both are insufferable air-heads with a sense of entitlement. Eh.. I don’t really know what you are talking about. Gee doesn’t like to flaunt her relationships. She is often low key about those things. it’s more like the HK media like to follower her and report about her love life. I think you have something against her so no matter what the news is about Gee you will dislike her. @Jupi: Disagree. Gigi does like to flaunt her relationships, as her past history with Ekin shows. She is anything but “low key”, lol. If she was low key, she wouldn’t be beaming happily when caught spending the night at Ekin’s apartment on his birthday while he hadn’t yet officially broken up with Maggie Siu yet. Obviously this woman never had any discretion when it comes to hers relationships, and she was proud to show off that she was the current girlfriend of Ekin. It wouldn’t surprise me if it was Gigi herself who tipped off the media about her and Ekin so that they could be front page news. What Gigi didn’t expect was the public disgust with her and Ekin and sympathy for Maggie; she thought everyone would love Ekin and her as the ‘perfect pair’. Serves Gigi right for over-estimating her appeal to the public, lol. @felicity, dang! Wouldn’t wanna be your friend when I’m happy and flaunting my happiness. @Jujubean: Well, it depends on who you are (joking, lol). I’m usually happy for my friends who’re married but then my friends are not attention-seeking celebrities who act all smug around me about their perfect lives. Gigi always annoys me when I see her on interviews. That girl always had a privileged background and knows nothing about real poverty. She’s very uppity and entitled (just like Gywneth Patrow and her stupid website GOOP giving advice to her loyal followers about healthy recipes and lifestyle – except that not many can afford a personal chefs, fitness instruct0r like dear Gwennie) and acts too pleased with herself for the most part. The only thing i remember this girl was how she claimed that she ‘loves eating yee meng noodles’ on one of her concerts haha It was either before or after her relationship w/Ekin Cheung. I guess she is the kind of girl who can’t keep a relationship low profile. Just like this Jewish colleague I have, she has to tell someone she is dating all the time, it’s like her everyday life. Some can be very private but some are NOT. @kiki: Yup, we can safely put Gigi in the NOT low profile/private category. This woman can’t stop showing off her relationships. Ekin was not as keen as Gigi on the PDA in the past, but they did also kiss in the car and in Japan when they were on holiday before. Of course, the paparazzi reported on it. Showing PDA doesn’t make Gigi a bad person, but I don’t have to like her either. yes, happy people should stayed locked up in their rooms and never reveal their happiness to anyone else! It’s really annoying for people who are miserable to see people actually enjoying themselves in public! @TVBFanatic: I’m very jovial and satisfied with my life, not miserable like you think. Thank you for your concern! Felicity, don’t be so judgmental. When you experience real love wouldn’t you want to display it anywhere? @Mr. Lee: Sure I can be judgmental, but so are you and everyone else who comments on these celebrity websites. Aren’t we all judgmental human beings to a certain extent, talking about famous people’s lives? Now, as for your question – no, even if I was madly in love, I still wouldn’t be making out in a car or at a freaking airport with thousands of eyeballs watching me. That’s just not my style. And I’m not even a celebrity. Love is between two people, it’s not for show. Most famous celebrity couples like Amy Kwok & Sean Lau, Esther Kwan & Nick Cheung, even dating couples like A Sa & William Chan know how to conduct themselves with more decorum and discretion. They don’t need to make out like rabbits in public to declare their love/affection for each other, unlike Gigi & her husband. I’d give him the benefit of the doubt, since he’s a foreigner, but Gigi should know better as she’s a HKer. If they were in Spain or on their honeymoon abroad, it’d be a different story. Kissming in public in Hong Kong is a deliberate show for the HK paparazzi. She’s happy, it’s a good thing. @Felicity, how does being happily married make Gigi an ‘insufferable air-head with a sense of entitlement’?? How did you come to that conclusion? @Mt: I don’t like to repeat myself. Read my above replies to others. If you don’t see it, I can’t help you. No biggie, not everyone sees things the same away. Happy for her. Not getting younger though so should start trying for a baby. It was probably because Ekin had broken up with Maggie Shiu (he said he would love and take care of her forever…youthfully sweet but stupid!). People blamed Gigi and accused her of being the third party. Gigi should be happy, not only because of her new beau and marriage, but also because she can finally be rid of Ekin and the negative reputation she got from dating him. Good on her! OHHH YES, I remember that ‘I will take care of her forever’ ahahah LOL…Making that kind of promise definitely made him one of the biggest J**KS when he broke up w/Maggie after being together almost 10 years? Yes, then this Gigi Leung came along, of course her reputation is ruined of it at that time, she probably was the blamable party involved since she did admit how she likes him before but it takes 2 to tango so you can’t blame one and not the other. Oh well, good thing they all have their other halves now…. Attention seeker! I wonder if she purposely did it to get some news…. No one is talking about her am I right? Who cares if you kiss your hubby or not? This woman looks like an angel but she’s got a dark dark core inside. My friend told me a brief and unexpected interaction with her. She went into the washroom/powder room of a hotel minding her own business fixing her make up in front of the mirror. At the time, the washroom was very busy and every sink in the washroom was being used by a patron. So out comes Gigi Leung from one of the stalls. No one really recognized her there because everyone was doing their own thing. She rudely pushed her way towards my friend’s sink and shouted “Get out of my way. Do you know who I am?” My friend was thinking in her head what just happened and who is this vile woman beside me. It was when she looked over that she realized it was Gigi Leung. Hahaha…LOL how interesting, I do sense a DIVA attitude from her as well when you hear her on functions. She does have that innocent looking face thou.